It’s barely the end of August but already there is a distinctly autumnal nip in the morning air. Having only sowed for the summer season, my vegetable garden is looking a little sorry for itself. Gone are the peas, beans, berries and courgettes. All that is left is a few hardy head of lettuce, the new potatoes and some gorgeously dumpy dwarf carrots. Aren’t they adorable? Wish I’d grown more of them as they are wonderfully sweet. Precious as they are, I’ve been keeping it simple and eating these carrots raw dipped in humous or steaming whole and serving with fish. 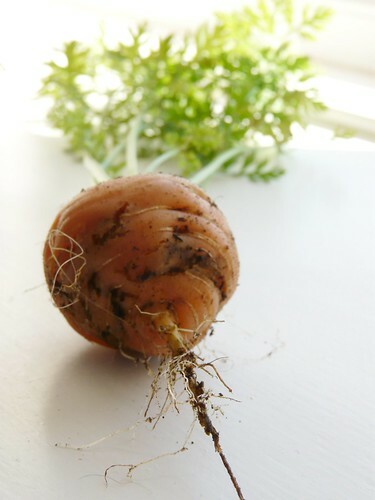 Perhaps next year I’ll grow rows and rows of this root vegetable and be able to use my own carrots in the soups and stews I often make. A bunch would undoubtably end up in the following burgers too. Adapted from a recipe from Good Food’s Vegetarian Summer, we’ve been enjoying these in big seeded buns with lots of tomato relish all summer. Messy eating but absolutely delicious. Fry the onion in a little olive oil until softened. Add 1/3 of the carrot to the pan and fry for another few minutes until softened. Whizz together chickpeas, the remaining carrots, tahini, cumin and egg in a blender until a thick paste is formed. Add the onions and cooked carrot to the paste along with the breadcrumbs and lemon zest. Use your hands to combine the mixture well. Season carefully. Shape the mixture into four equal patties, approx. 2cm thick. Coat in sesame seeds and chill for at least an hour. Fry in olive oil or brush with oil and place under the grill until golden and cooked through (10-12 minutes). Serve in big buns with relish and lots of salad. These look amazing, Wendy. Yet another recipe that makes we wish I would finally break down and buy a food processor (had to leave my old one behind in the states, unfortunately). Love you description of the carrots! Oh, my word. He’s the spunkiest carrot I’ve seen for a while. Have you been using the tops at all? I’m bookmarking this immediately – with tomato relish sounds fantastic. My son and I made calzone last night and another pizza with garlic butter tucked under the circumference ~ very nice. my favourite recipe for carrots is carrot and orange soup. We are definitely going to try these. The addition of cummin is good as it is supposed to be a very healthy spice. Like your other fans I think these round carrots look super, could you tell us their name as I would like to try these next year. These sound both fantastic AND beautiful. Hmmm. I wonder if I could get ECG to eat them. Here here Wendy! Autumnal nip down here, posted something similar on my Blog the other day. Beautiful veg burgers. Hope life is good. I start teaching next week! Good luck for your return. Love you’re blog and I’ve made a few things from it now. I tried these burgers last night and they were completely delicious. I used butter beans instead of chickpeas (not through choice, my supermarket was having a mysterious tinned chickpea drought) and sesame oil instead of tahini but they were still fantastic. love the carrot/cumin combination – kind of a Morroccan feel, yum! Siri – Its funny, I go for months without using it and then can’t live without it for weeks. Lucy – I haven’t and I didn’t know you could! Feel rather wasteful now… Off to do some research. Becky – They’ve made it on to my partner’s list of acceptable veggie food! Johanna – This is the first year I’ve managed to grow them. The carrot fly usually get them! Pippa – Oh, that calzone sounds luscious! Wendy – I think it was these ones: http://www.suttons.co.uk/Shop/Vegetable+Seeds/Carrot+Parmex+Seeds+157564.htm Not entirely sure though. I picked dwarf ones as I was growing them in grow bags rather than my veggie garden. PS My parents LOVED Wales. David – Teaching? Change of career? Good luck! It’s a great job. I love it. Chrissie – Yeah, there was something a bit Morroan-y about them. Thanks for the link Wendy, I’m definitely going to get some of these for next year. So pleased that your parents liked their Welsh trip. Ziabaki – Hope you enjoyed it. I’m loving these just now. 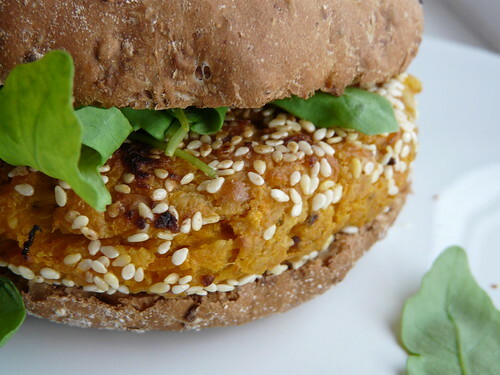 I love chickpea burgers and these ones look so yummy.